CoachAccountable Groups empower you to create a community of your coachees – or, Groups can be secret so that only you, the coach, knows who’s linked together. 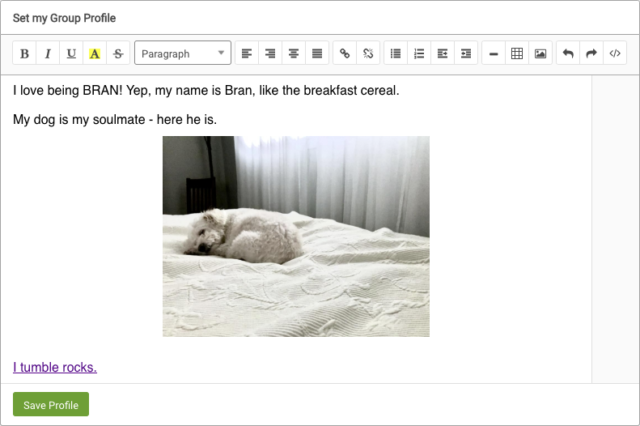 You can use Groups to send assignments or files to multiple participants at once, keep engagement going even when you’re not there, track progress, and even put Groups through your Courses. 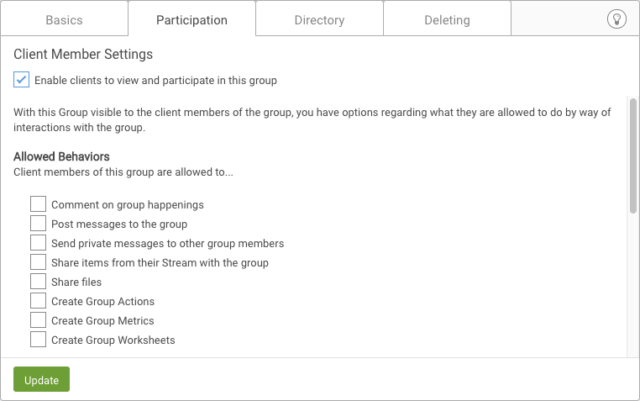 Groups have various privacy settings, including what clients are/aren’t allowed to participate in, and you can now enable personal profiles in Group directories. For each Group a client (or coach) is in, s/he will have the ability to create a distinct profile (if, of course, you’ve allowed it). That enables clients to tailor their self-descriptions to fit the situation; maybe they’re in one group with you for addiction coaching, where the profile might be more revealing, and one group for general community, where the description might show more fun-loving personality. 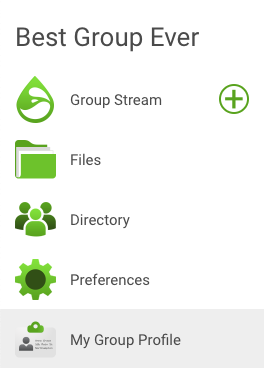 Inside a given Group, go to Settings. In the Participation tab, select “Enable clients to view and participate in this group.” Without being able to see the Group, clients won’t be able to see each other’s profiles. Next, click on the Directory tab, then select either “Offer an Opt-in Directory for this Group” or “Offer an All-Inclusive Directory for this Group”. Without a directory, profiles wouldn’t make much sense. 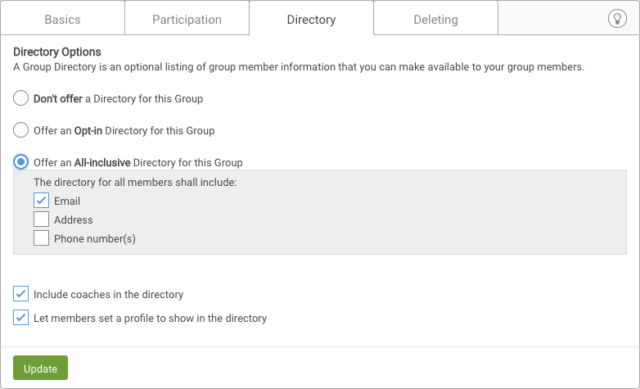 Then, check the box for “Let members set a profile to show in the directory.” When you click Update, an extra tab on the left will appear: My Group Profile. Here you’ve got the standard CA WYSIWYG editor, where you can add photos, videos, links, and more. This is a VERY serious group. Inside the Group, you and the clients can click on the Directory tab. Anyone who has a profile set will have a “view more…” link over on the right. That’ll display the person’s profile. 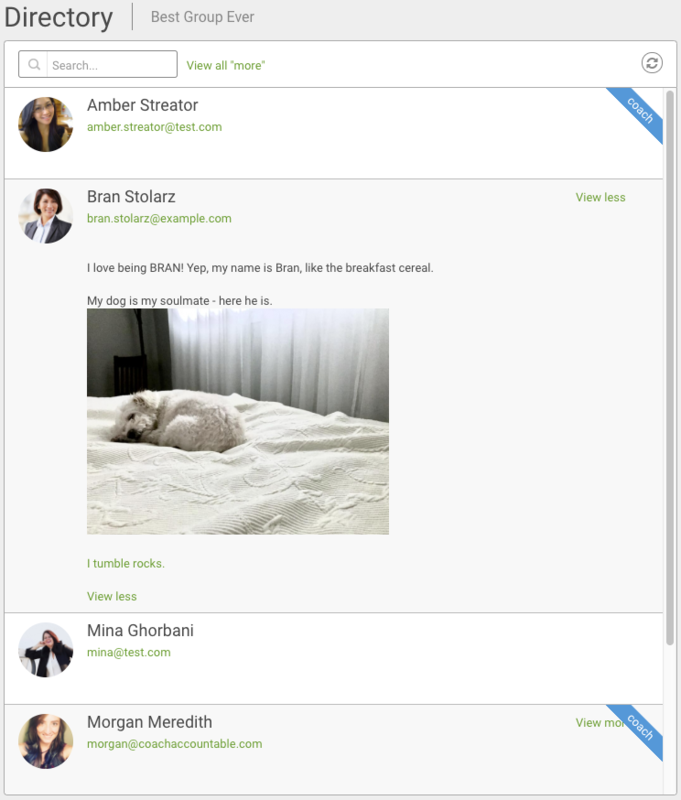 Also, you’ve got “view all ‘more'” at the top of the directory, which will expand all the profiles at once. Also, “View more” becomes “View less” when a profile’s expanded. That’s all it takes! Here’s to your Group members learning more about each other and having deeper interactions within the coaching management platform. Ready to upgrade the group coaching experience by dropping that Facebook group? Sign up for your free 30-day trial of CoachAccountable. © 2018, JPL Consulting LLC. All Rights Reserved.